Here’s my last one for breakfast, usually set aside for Sundays. I’m posting this at the top and I know this is not usual but so what? Please don’t miss the other breakfast tips below. I really like the Artisan whole grain loaves from Costco. They are from La Brea Bakery in CA and come in a pack with two loaves. Best part, it’s the same price of one loaf at most supermarkets which makes me happy. 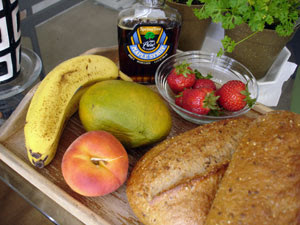 Breakfasts always include fresh fruit. The mango looked green but was ripe and ready to eat, you can tell by the sweet smell. 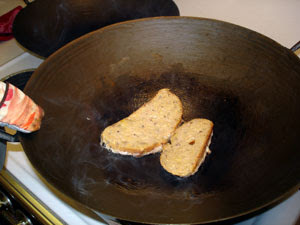 I soak slices of bread in wash of egg, little milk and a drop of canola oil but my husband, Ralph fries them in our wok. He’s better at these, he gets them crispy outside and soft inside. Delish. You’ll notice we have another wok in the back. Yes, it’s “stereo wokery” at our house, people laugh whenever I mention this in my cooking classes. Here’s our version of French Toast with Maple Syrup and side bowl of fresh fruit with all the toppings. See below. 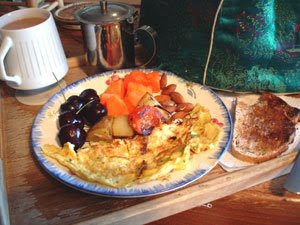 Omelet with chopped scallions, leftover potatoes and tomatoes. Toast and fresh fruit of cherries and papaya. Handful of toasted almonds. Also, watch Ralph’s amusing and popular video, Care and Feeding of Your Wok (over 56,000 views on Youtube!) in side bar on this blog. His omelet/pancake, “salmonbrocapricot” or some such silly name. DELICIOUS. Having lived in England for 17 years, I am a huge tea fan. I own a very rare embroidered tea “cosy”, I say rare because it’s difficult to find even in Asia! Ralph calls my tea drinking a “ritual” when we’re on road trips. Tea is still not a popular drink in America and you cannot get boiling water in restaurants so your tea doesn’t brew properly, looks grey instead of a rich black tea, very frustrating and annoying. My favorite is Early Grey and Indian black or red tea, I like to use loose leaf tea. I throw out the old leaves into my Bougainvillea, makes great compost. I’ll post with tips on composting soon. Oh, did I go off track about breakfast? To me, breakfast is NOTHING without a good cuppa (British term). I use my favorite mug given to us by Ralph’s old schoolmate, Luke. So, whenever I use the mugs, I think of Luke, so cool. That’s what people say when they use my cast iron wok. The right mug is so important because it has to have the correct “balance” and “feel”. These are perfect, I love the 50’s look. The Brits offer a cuppa as a “solution” for coping with every occasion, from a crisis to just relaxing, it’s hilarious. I miss British humor, very dry and sarcastic. Steel cut oatmeal with dose of Quinoa flakes. Add protein powder, soy milk, textured protein flakes. 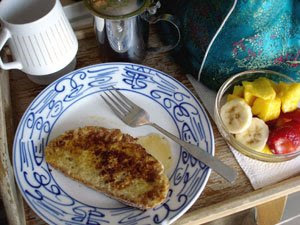 Top with fresh fruit (always banana), toasted almonds and hit of granola. 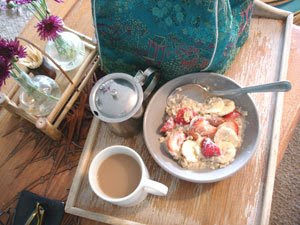 Just eating oatmeal is too much carbs for me, I’m on the cusp of Type II diabetes, here’s more about this topic in Healthy and Delicious Snack Tip. “Minute” oatmeal doesn’t have any oompf or texture, it’s like baby food. It’s important for me to always balance protein and carbs so I don’t have a false high and a big dip. 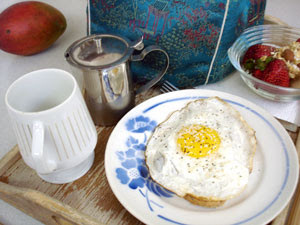 My absolute fav is fried egg over easy on toast. Side of fresh fruit and Cabot, Greek Style yoghurt with all the toppings as above.